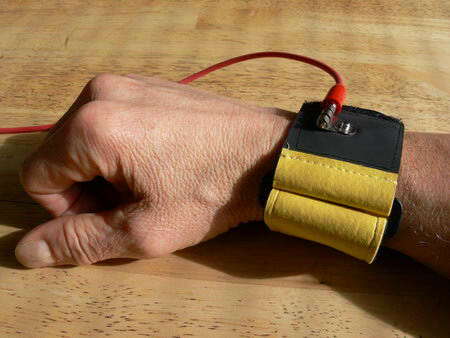 After years of searching, we now have custom made, comfortable and wide wrist-straps that can be used with the AutoZap zapper to free your hands while zapping. Please note that they now come equipped with snaps that work perfectly with all Auto-Zap zapper wires. They no longer have the banana plug socket as shown. These new SuperStraps are specially made for us right here in Canada. Because they are about three times wider than others [see a competitor’s strap at the bottom of the picture] they give MUCH better contact over a large surface area on the wrist and maintain that contact throughout the entire zapping session. 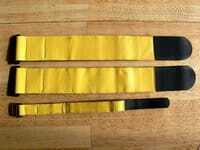 The secure Velcro buckle and closure also help to place pressure on the flat top and bottom of the wrist, unlike flimsy elastic straps which concentrate force on the bony edges of the wrist. They will not cause the burns and other problems of the narrow wrist straps sold by others. The yellow absorbent surface is backed by a high tech conductive carbon fabric, providing a good moisture reservoir and electrical conduction. The rugged snap connectors fit our kevlar-reinforced custom snap cables. Our new SuperStraps are useful for zapping with children, the elderly, and pets. Because of their personal nature, we recommend that each user have their own set. If you share your zapper with a pet you should always use separate straps or footpads for them. Get yours today! Click Here to Order SuperStraps at the Zapper Store.